Stevie and Maison have a great friendship where they travel back and forth between the Overworld and the human world. Maison has earned some fame for battling off the mobs at her school, but the attention has also brought about cyberbullies DestinyIsChoice123 and TheVampireDragon555, who have hacked her computer and discovered the portal! Now, through complex coding, the cyberbullies have turned the Overworld into eternal night and unleashed a pack of zombies, allowing their griefing to reach a whole new level. Things become even worse when DestinyIsChoice123 and TheVampireDragon555 are bitten and turn into zombies themselves. Because they’re human and not Minecraft characters, they have all the powers of a zombie while retaining their intelligence, creating a new breed of zombies. TheVampireDragon555 is even able to control and rule over the zombies, letting him raise his own army. Stevie and Maison run for the village to warn everyone, but it’s too late: all the villagers have been turned into zombies. In the midst of the eternal night they’ll have to fight off zombies, and find supplies to make potions to save the villagers and the Overworld. Sky Pony Press, with our Good Books, Racehorse and Arcade imprints, is proud to publish a broad range of books for young readerspicture books for small children, chapter books, books for middle grade readers, and novels for young adults. Our list includes bestsellers for children who love to play Minecraft; stories told with LEGO bricks; books that teach lessons about tolerance, patience, and the environment, and much more. 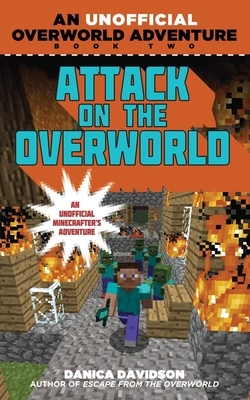 In particular, this adventure series is created especially for readers who love the fight of good vs. evil, magical academies like Hogwarts in the Harry Potter saga, and games like Minecraft, Terraria, and Pokemon GO. While not every title we publish becomes a New York Times bestseller or a national bestseller, we are committed to books on subjects that are sometimes overlooked and to authors whose work might not otherwise find a home. Danica Davidson has written for MTV, The Onion, the Los Angeles Times, and about fifty other publications. She is also the author of the Unofficial Overworld Adventure series, as well as Manga Art for Beginners from Skyhorse Publishing.